In addition to the themes covered in the previous posting, here’s to summarize some of this year’s sessions (with a couple of notes linking to our own project). The themes included: new research methods, postmodern and ethnic consumption, challenges linked to public goods/services, class dynamics and consumption, consumer culture in third world countries, consumer resistance/culture jamming, culture and ideology, market-mediated relationships, the contested notion of place that shapes consumer experiences, femininity, consumer-marketer co-creation, community and family, mediated images and ideologies of body and health, consumer identity practices, critical questions on consumer culture terminology, and finally, socio-cultural construction of authenticity — session where we presented this time. I particularly liked the session on new methods. Visual Analysis (VA) was explored as a tool for gaining cultural insight on consumer behavior and practices. Kristen San Jose presented a piece in which she applied VA in the context of fashion consumption in Tokyo. Although there’s a long tradition of visual research in CCT, I agree that there’s plenty of future opportunities in this regard. For instance, researchers (and companies alike) often rely on text-based analyses. For us, it would be interesting to extend VA also towards moving images / video, something I haven’t seen yet. Adding nicely to the session, Alex Thompson’s presentation brought about interesting views on how companies perceive and conceptualize consumers, in a study where commercial ethnography was the focus. I liked the way in which video was used as a means to communicate consumer knowledge to company executives — this nicely contrasts with more traditional ppt presentations and figures we’re used to. Alex’s points about different mechanisms at play, including rituals, embodiment and symbols, are something video really can capture in an intriguing way. Another interesting session set out to re-conceptualize the contested notion of place. Drawing insights from material culture theory, Jeppe Trolle Linnet’s presentation shed light on material and social aspects of place and space in the context of home and homeyness (what he called ‘hygge’ in Danish). It was interesting to see how this hygge is constructed and negotiated in different settings, not only at home but also in other social places such as neighborhoods or communities. They act as a sort of social comfort zone, a cozy, warm, and safe environment that is distinguished from other non-hyggelig, cold, and modern places. In a closely related study Zeynep Arsel and Jonathan Bean presented on ‘apartment therapy’ — a conduct in which people modify their homes through interior design to better match their desires. In our own research we’re also interested in how such interlinked and mediated cultural spaces and sites are at play. In the co-creation session, several papers sought to understand the cultural dialogue and co-creation between consumers and producers/marketers. Robert Harrison presented a fascinating paper on Black Friday – a sort of corporate ritual and event which is largely the result of consumer’s active participation during a consumption event. Another really nice paper was by Daiane Scaraboto and Rob Kozinets who investigated the community of geo-cacaching — a sort of GPS treasure hunt game invented and organized by consumers. This study showed how consumer’s infinite innovative potential, playfulness, and creativity plays an important role in the creation of a new markets — exactly what we’re also seeing our own study. Finally, our own session in which authenticity was explored as an essential component and a driver of culture. I think the session was very interesting as it nicely brought together three distinct viewpoints on authenticity — namely brand, place, and consumption-production interplay. As it was noted, in consumer research authenticity is often investigated by looking at consumer perceptions, and it is commonly tied to certain objects (e.g. brands), lifestyles, or places. In our presentation on electronic music culture, we wanted to consider how authenticity — which often drives cultural change in (music) culture — is actually achieved and negotiated by different influential cultural agents. 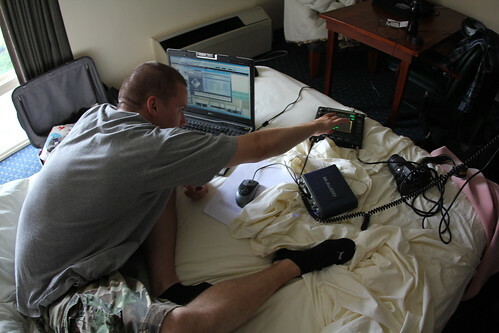 In our study these agents in fact simultaneously adopt the role of producers, DJs, and consumers. We also brought with us our new research team member Risto (aka Desto) who is an authoethnographic member in our research team and a DJ/producer himself. This move was very well received, and we had lots of lively discussions after our presentation. Thanks for everyone involved! Overall this fifth annual CCT conference pointed out many interesting future directions. Especially, the increasing attention to spatial and embodied aspects of culture as well as emphasis on creative methodologies — including audiovisual and multi-method approaches — brings to the fore new thrilling work that is currently emerging. 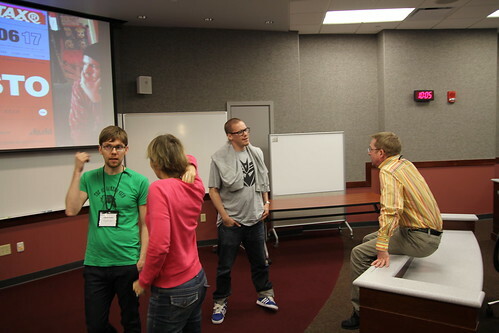 Joonas and I just attended CCT5, consumer culture theory conference in Madison, Wisconsin, held at the Grainger Center of the University of Wisconsin’s Wisconsin School of Business. 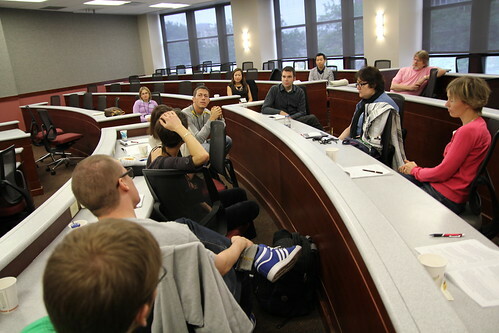 Attendees consist of academics interested in cultural research in the field of marketing and consumer research. We presented a preliminary account of our new videography project, ‘Pushing the Scene’, in which we attempt to build rich accounts of the negotiation of the social constructs of authenticity in the dubstep electronic music subculture. 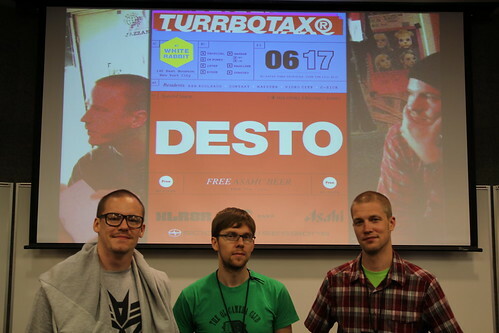 The newest member of our research team, Risto Roman, was also present to bring further insight into the cultural realm of dubstep (Risto produces and DJs under the alias Desto). Relaxing after our presentation on Sunday morning. Like Rob Kozinets has already pointed out in his insightful blog postings, this was the best CCT yet. From my humble vantage point of having attended approximately 20 conferences in international contexts, I can do nothing else than to wholeheartedly agree! Indeed, the presentations and discussions were of high quality, but I must also emphasize what consists of the true magic of the CCT gatherings – the laid-back atmosphere and the truly engaging conversations that occur beyond the conference agenda (yes, this would also entail the great parties this year and before). A special shout-out must go out to Rob, Alex Thompson, Marylouise Caldwell, Paul Henry, Handan Vicdan and Sofia Ulver-Sneistrup along with others making up our outgoing posse. Good times, good times. Like the saying goes, this trip was not one of economy or its health-promoting qualities. Coming back to Rob’s blog, he has already provided an in-depth account of the conference and its contributions (and rumors and some minor controversy). What happened in the first session was that Eric Arnould called for the cessation of case studies in the CCT field. The discussion developed into relatively voluminous amounts of spilled digital ink (see also the comments in Rob’s blog) about what became resolved as an issue of conceptualization. This approach is further clarified by Robert Kozinet’s following point “…ethnography leave unclear what the difference is between “single” and “not-single”. From my perspective, there thus seems to be more agreement than not on the larger issue, which would naturally have to do with the further work of legitimizing CCT research in general. This task can be undertaken by further development of a focus in robust theoretizations and deep ethnographic takes. Certainly, if scholarly work in our field remains primarily focused on a description, we we stand to lose a lot of our potential. From my perspective, especially one that is now fortified with encouraging experiences in the CCT5, the general ethos of the CCT crowd is exactly doing this, moving to the direction of emphasis on theoretical work and (even) more holistic approaches into various consumption contexts. Another thoroughly interesting moment was the luncheon keynote on Friday by John Deighton, the editor of Journal of Consumer Research (JCR), the most prestigious journal in all scholarly things consumer. One of the core insights he shared was the increasing need to consider the impact of CCT for managers – i.e. what can CCT offer in the practice of companies’ marketing efforts. Indeed, it seems, that the cultural side of the matter is becoming increasingly recognized by companies also (e.g. Proctor & Gamble, Nokia), and therefore we must contemplate our role in this transformation. This provides opportunities for interesting shifts in ethos, as many CCT scholars with their close affiliation to the critical marketing discourse have traditionally not been closely tied to the managerial end of things. Perhaps, as cultural insight becomes increasingly relevant for companies, they will also provide us with more interesting opportunities for cooperation to bring in thought that has less to do with the reduction of the consumer into a number and more to do with holistic and co-creative approaches. Thus, we CCT researchers must remain ever vigilant in reminding ourselves to keep and open mind and readily pursue these opportunities as they emerge. Perhaps, in the future, there may be new openings for positions of chief cultural officers, as McCracken calls it. Regarding the contributions of the CCT crowd in JCR, Deighton gave us some juicy morsels along with more sobering accounts and suggestions for the future of CCT research. Now, it must be remembered, that even with the encouraging growth of the CCT tradition, we are still far from being a firmly established and traditional field – some would certainly refer to us as still being on the fringe. For these reasons it was truly inspiring to have Deighton tell us that CCT accounts for much of very interesting and high-quality research in the journal. Thus, he contended, we CCT scholars have (in terms of the number of researchers in the field) become ‘over-represented’ in the journal. However, he continued, with growth comes responsibility and the need strategize and find ally discourses in academia. One such promising field could certainly be anthropology, with their ongoing trends of becoming increasingly interested in subcultural phenomena and becoming less ‘realist’ and more interpretative and reflexive. While Deighton’s insights are certainly valuable for our field – indeed we need to display a more cohesive whole to become more distinctly recognizable – it is my belief that CCT’s somewhat Feyerabendian approach of (virtually) ‘anything goes’ has and will continue to be a source of interesting research and creativity. Naturally, this ‘anything goes’ does not mean complete ontological and epistemological relativism here, but rather denotes the ongoing freedom to pursue social phenomena from diverse theoretical perspectives and a relatively liberal methodological toolkit. Social phenomena will continue on to consist of equally diverse constructs – constantly negotiated, constantly evolving – and thus we can certainly draw form a tradition promoting freedom and courage in our work. Risto creating a soundscape for Robert Kozinets's presentation in the poetry session. The way of the mobile artist. 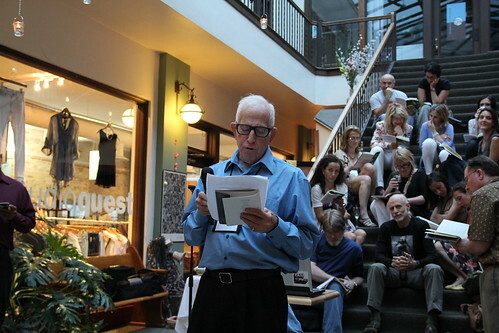 Sid Levy reciting his work in the poetry session. Anyway, thank you CCT for a fantastic experience. See you guys in EACR London in a couple of weeks. Meanwhile, we’ll hang out in the Big Apple to continue our project of exploring the negotiation of authenticity in the electronic music subculture of dubstep. Lots of film to capture! 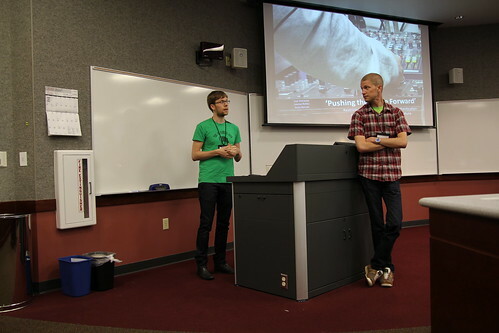 Joonas will provide a more detailed account of the presentations in the conference, and I’ll be sure to jot down an account of our experiences in NYC also. I finally found the time to blog about my doctoral dissertation after a busy round of conferences and filmmaking this summer. I successfully defended my thesis, titled “Exploring the Cultural Logic of Translocal Marketplace Cultures: Essays on New Methods and Empirical Insights”, at the Aalto University School of Economics in May 2010. I had the honour to have professor Robert Kozinets (York Univerisy, Schulich School of Business) as my co-examiner and opponent. To explain briefly, my dissertation research involves taking a cultural, practice-oriented perspective to consumption and markets. It pays attention to the new forms of marketplace cultures that have recently emerged due to cultural and technological transformations such as the increasing hypermobility of people and new means of digital communication and connectivity around the globe. New computer-mediated social networks – iconized by Facebook, YouTube, Twitter, and other consumption-oriented online communities and groups – have given rise to new kinds of cultural production. My dissertation examines the translocal nature of such phenomena: culture, identity, space, and sites that are not bound or limited by particular national, geographic, or territorial constraints and through which consumers’ lives, experiences, and practices are increasingly mediated today. The key notion of the dissertation is translocality, which refers to a transnational network of interconnected local sites and social spaces, both physical and virtual, through which culture is increasingly being negotiated, shaped, and produced. To conceptualize and provide concrete examples of translocal cultural production, the dissertation investigates consumption-oriented communities, the so-called ‘consumer neo-tribes’, as particularly good examples of translocal communities. By investigating consumer communities that gather around a common interest or lifestyle – I studied budget travelling and extreme sport activities (paintball) – the dissertation offers insights suggesting that translocal communities and practices play an important role in transnational cultural production. The empirical studies illustrate how translocal communities increasingly collaborate, share information, exchange knowledge, and negotiate consumption practices via new digital media. In addition, the findings show that the new communication media, combined with less constrained transnational mobility, has made it possible for consumers to take part in various consumer communities in radically new ways and with less effort. These key developments, the dissertation claims, have spurred the creation of more profound, organized, empowered, and transnationally spread consumer networks. My dissertation also lays out new approaches and methods for studying translocal communities and practices. Based on ethnographic fieldwork in both online and offline settings, I develop netnographic and videographic methods that may benefit companies, researchers, and policy-makers in analyzing how new forms of translocal marketplace practices emerge, spread, and transform. 1. Rokka, J.: Netnographic Inquiry and New Translocal Sites of the Social. International Journal of Consumer Studies, 34, (2010) 381-387. 2. Rokka, J. & Moisander, J.: Environmental Dialogue in Online Communities: Negotiating Ecological Citizenship among Global Travellers. International Journal of Consumer Studies, 33, (2009) 199-205. 3. De Valck, K., Rokka, J. & Hietanen, J.: Videography in Consumer Research: Visions for a Method on the Rise. Finanza Marketing e Produzione, 27, (2009) 81-100. 4. Rokka, J., Hietanen, J. 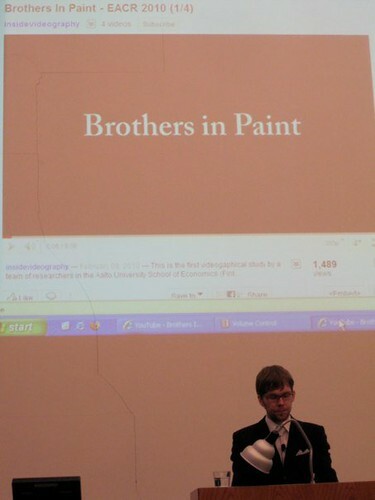 & De Valck, K.: Brothers in Paint: Practice-Oriented Inquiry into a Tribal Marketplace Culture. In Advances in Consumer Research, 37, (2010) Campbell, M.C., Inman, J., Pieters, R. (eds. ), (forthcoming). (Videography and paper). I was happy to get some attention from the local news media. I was interviewed by a number of newspapers who also made some of the material available online. To my slight surprise, the work and ideas presented in my thesis were well received by the reporters. I guess this can be considered some sort of success, at least when considering the fact that many academic works simply wont translate to wider audiences. I think one possible reason for this is that I had quite a few timely themes to discuss, including the consequences of social media, consumer tribes, video research, online research etc. In addition, what gained a lot of interest in my thesis was exactly what we’ve been discussing in this blog: research on video and its accessibility online. This is a good signal for our future work!